Here is a photo of me on a T20 racer! Its the last time I rode a T20 race bike. Taken at the "Thunder at the Tower" sprint, held at Hoghton Tower, Nr. Preston in 1998. It was the only time I rode it ! I just fitted a huge rear sprocket to it and away it went. It was a real flyer! The bike was built by Tony Mason and I for Tony to race in the Manx GP. 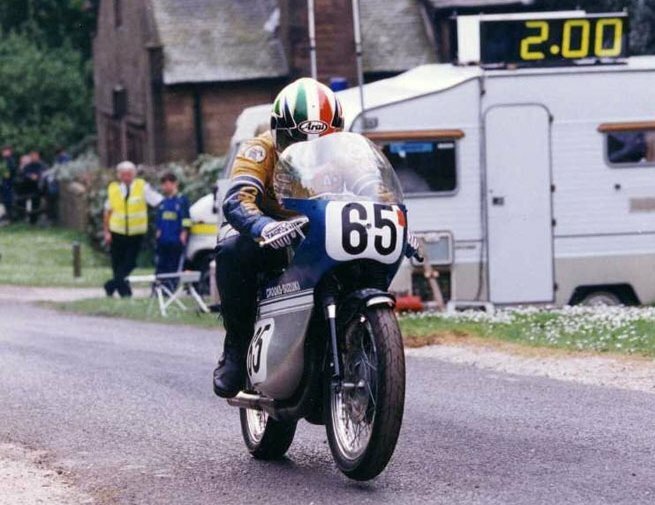 He finished 9th on it in the 1994 Classic Lightweight Manx Grand Prix. We sold it to Steve Clarke in Derbyshire in November 1998. He still races it as far as I know. Return back to Adrians' T20 'Your Bikes' page.